Something really big happens today! 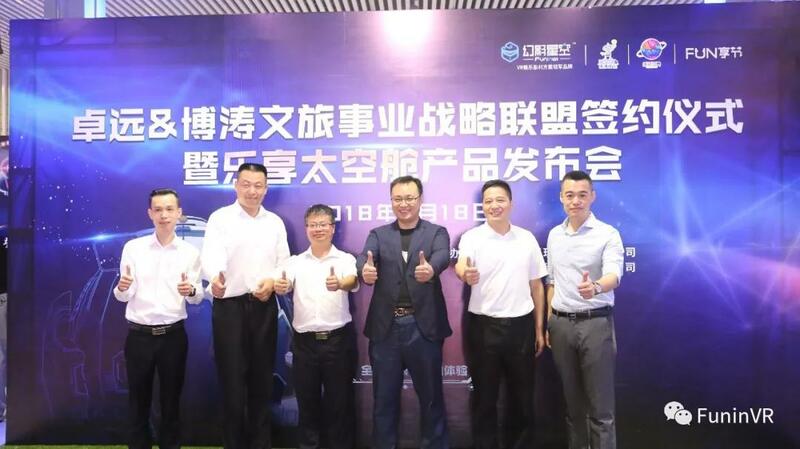 The ceremony for strategic cooperation signing between Guangzhou Zhuoyuan and Dalian Botao & new product release for Mini dome cinema is held in Guangzhou Zhuoyuan’s product exhibition hall at ten o’clock morning of May 18th. Many valued guests president the grand ceremony including Yang xuyun, the president of Guangzhou Zhuoyuan, Hejin, the vice president of Guangzhou Zhuoyuan, Xiao di, the president of Dalian Botao and Song yuguang, the general director of business of Dalian Botao. At the ceremony, both Yang xuyun, Hejin and their counterparts from Dalian Botao deliver their speeches. 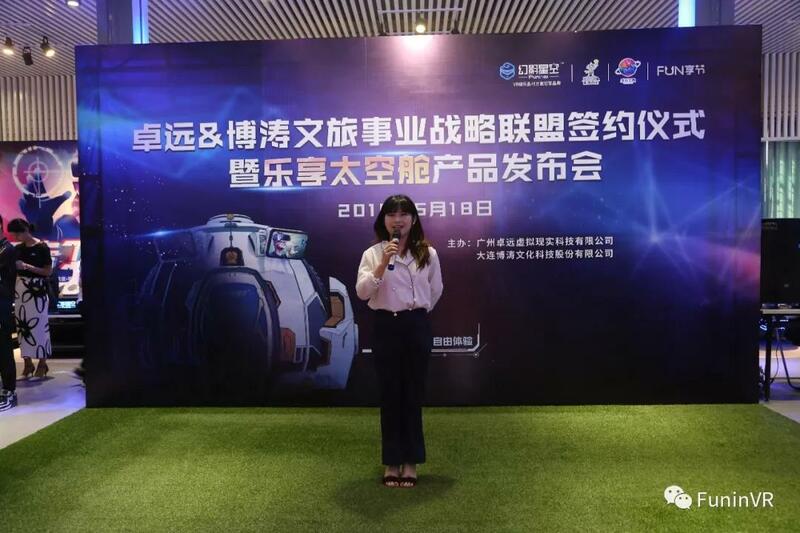 Yang xuyun and Hejin claim that Guangzhou Zhuoyuan has already become a heavyweight player in the research, development and manufacturing of various kinds VR products ranging from science popularization education, parent-kid education, tourism, pan-entertainment and many other major fields. 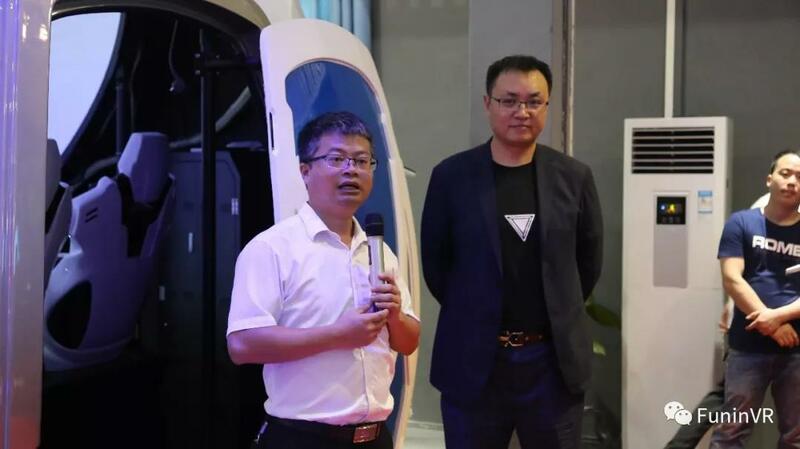 Yang and He highlight that Guangzhou Zhuoyuan will double its efforts in R & D of VR products in the upcoming future, hoping to contribute more top-notch products to the VR entertainment industry and enrich common people’s life by bringing them more fun and excitement. Xiaodi, the president of Dalian Botao, expresses in his speech that the strategic alliance between Zhuoyuan and Botao implies outstanding significance not only for both companies but also for the whole industry. 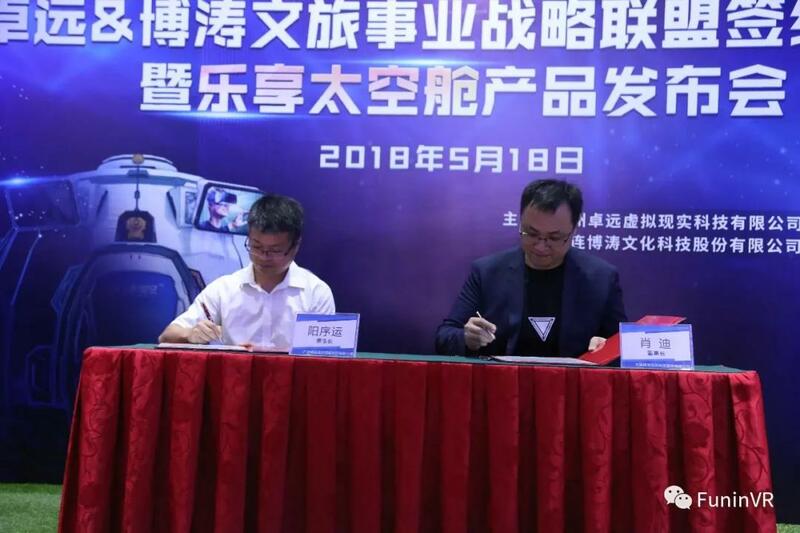 Fierce competition among companies in the final analysis is the competition of core technology and company resources, Song says, adding that the strategic partnership between of Zhuoyuan and botao will greatly benefit both parties and help the two in surviving the growing hot competition in the coming future. A leading VR products manufacturer who has specialized in the field for 19 years, its strong technological know-how accumulations help it in producing top-quality VR products which are sold to more than 100 countries across five continents. 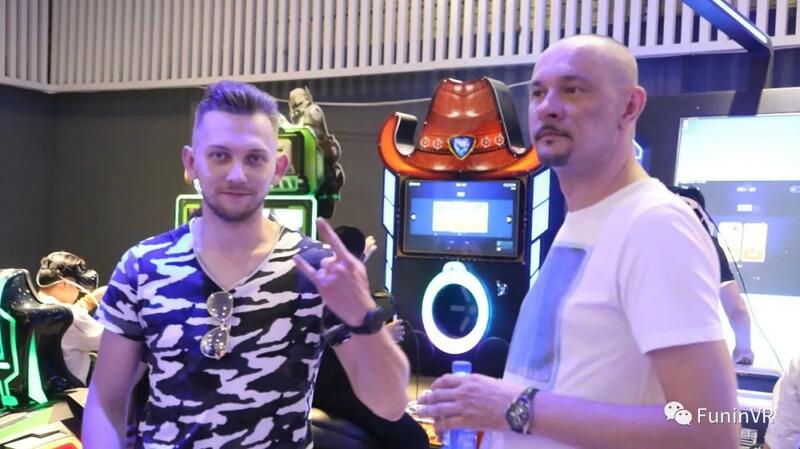 Besides that Guangzhou Zhuoyuan also plays as a professional profit solution provider for its franchised customers spreading all over the world. Dalian Botao(BeTOP), founded in 2005, is a well-known supplier for hi-tech tourism programs and theme parks, it has team of 300 people who are professional in creative idea-providing, design, production and software R & D. Dalian Botao has won many honorary titles like “The National Hi-tech and Innovative Enterprise”and A demonstration area for Shangdong provincial culture. 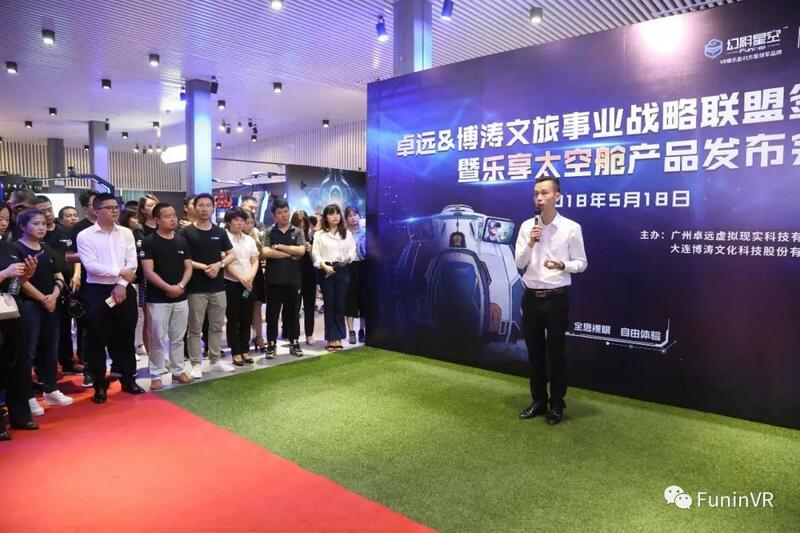 Apart from the strategic relationship signing ceremony, there is another event worth being spotlighted, that is the new products release ceremony for the Mini Dome Cinema. 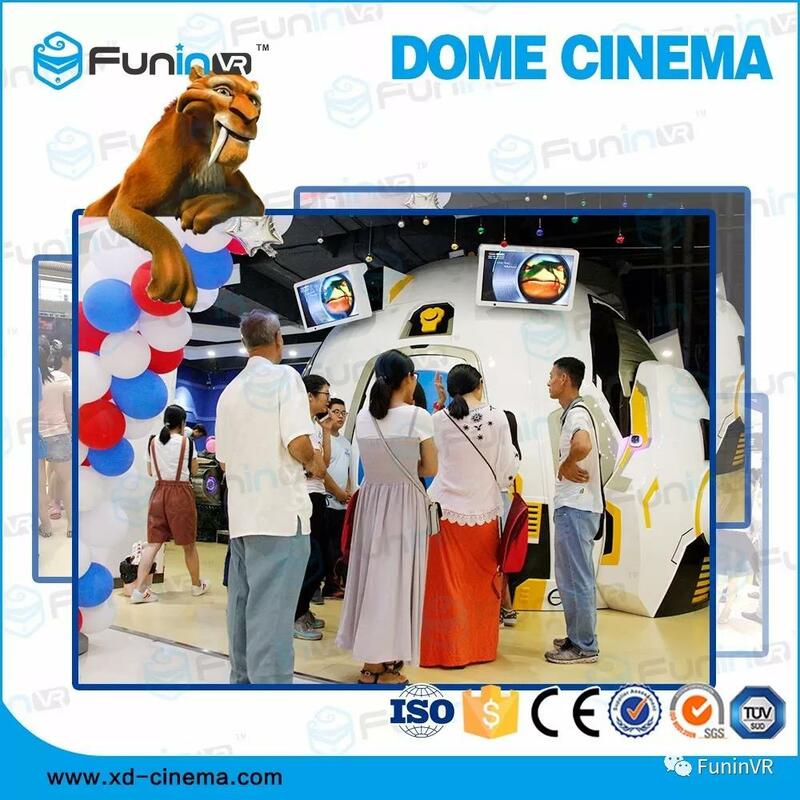 According to Song yuguang, the Mini Dome Cinema was firstly invented and appeared in America decades ago, but this type cinema at then was too expensive for commercialization. The newly released Mini Dome Cinema is a product co-produced under the concerted efforts of Guangzhou Zhuoyuan and Dalian Botao. As of date, the Mini Dome Cinema has already been fully commercialized for the whole market, it means the cinema becomes cheaper and more accessible for common people. 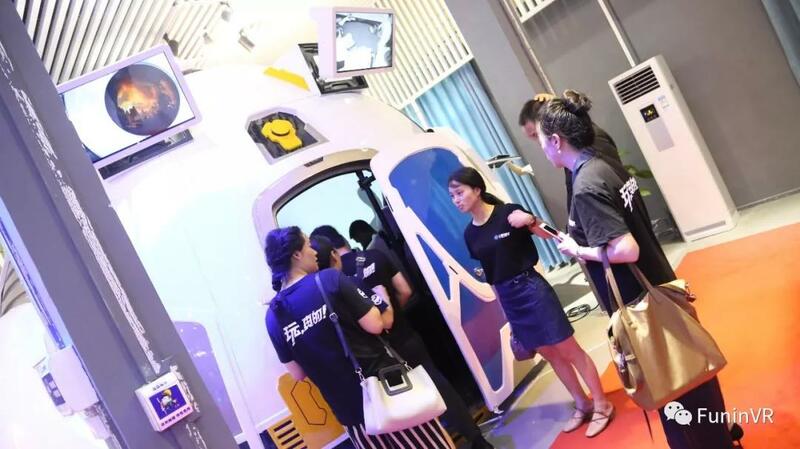 The launch ceremony will thus dramatically promote the availability for the its potential buyers probably like VR experience store, technology-themed entertainment park and others. The Mini Dome Cinema is widely called by many clients the “ Signature Product” for stores. Indeed, the miniaturized dome cinema offers its audiences unprecedented film-watching experience. We can safely and proudly say that the Mini Dome cinema will bring people into a totally new world for film-watching. Following are the details about the cinema. ❶Built with advanced motion-sensing equipment. ❷Required no wearable devices, full immersion with 360°3D vision. ❹Futuristic product appearance with attached external live broadcasting screen. ❺High ROI on area effectiveness, four audiences in one batch. ❻Installed with patented dynamic seats. ❼4K picture resolution higher than IMAX. 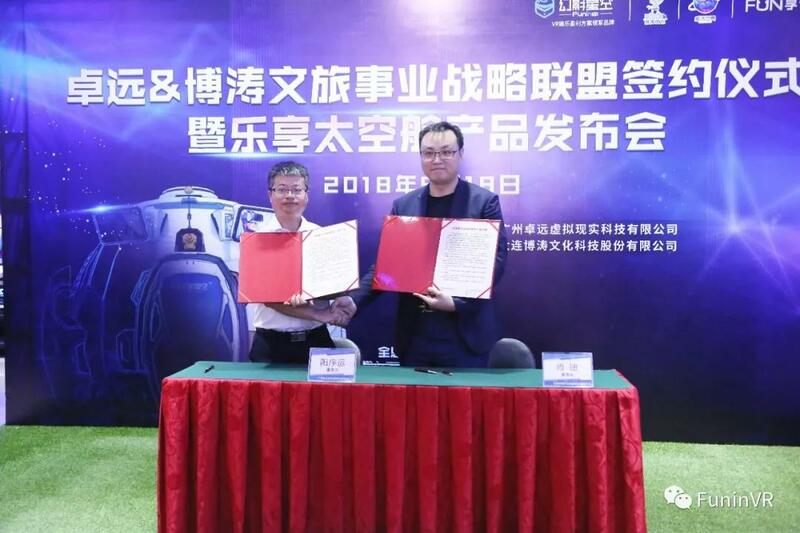 The establishment of strategic relationship between Guangzhou Zhuoyuan and Dalian Botao is based on mutual respect and win-win cooperation. 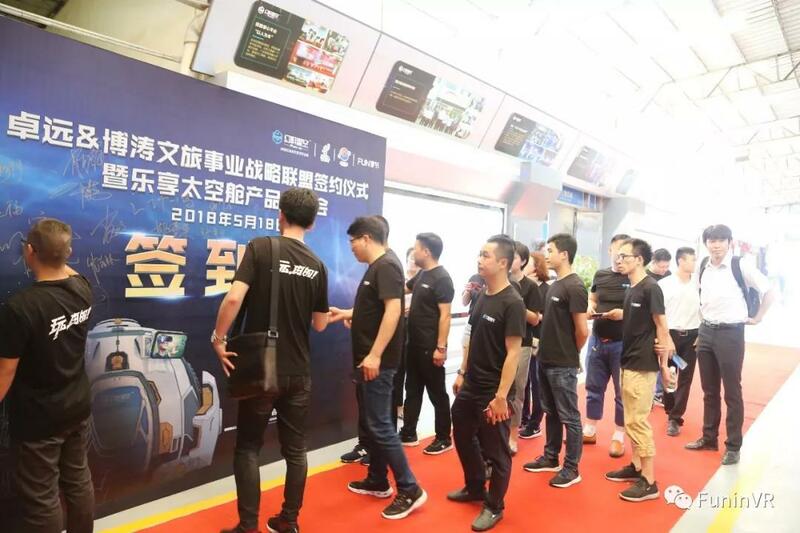 After the “marriage” of the two companies, Guangzhou Zhuoyuan will vigorously put more efforts and investment into the process of perfection of the product by fully mobilizing its technological and business resources. 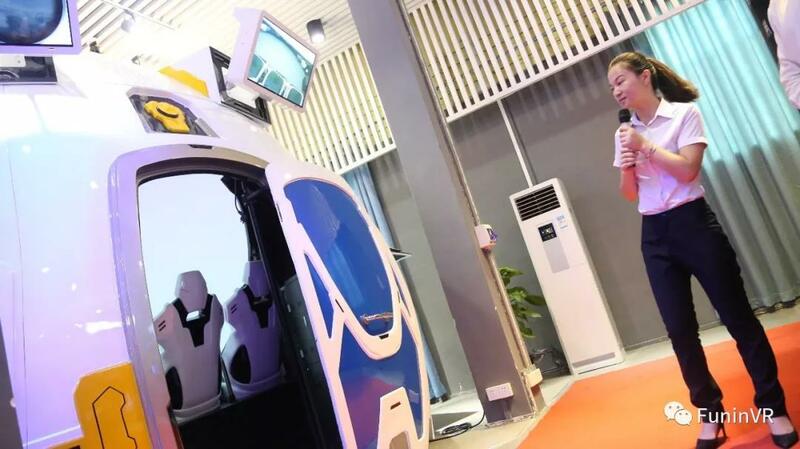 While Dalian Botao will also, by applying its great strength in R & D, market promotion, do its utmost to polish it to make it become a popular product for buyers. We firmly believe that the Mini Dome Cinema will widely accepted by more and more people under the allied efforts of the two sides. 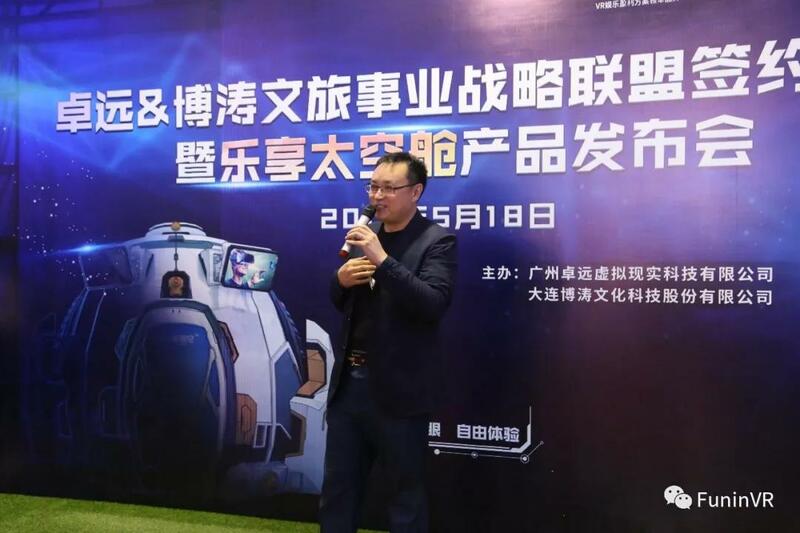 Guangzhou Zhuoyuan will continue uphold its comprehensively open mindset, looking forward to establishing strategic relationships with more companies who harbour the alike big vision of exploiting the VR entertainment industry, to developing and manufacturing more top products for the whole industry. The 2nd Operation Training Session Opens Today!